FAO: The Head Teacher - Newtown Primary School. I wanted to write to you and send you my sincere thanks for the wonderful gesture experienced by my daughter this morning. I write this as a parent in the Peak District with a daughter living many miles away (230 miles). My daughter is a second year Economics student at Exeter University. 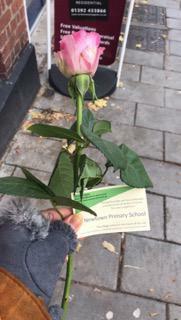 As she was leaving her shift at work this morning, she was given a lovely pink rose in an Act of Random Kindness. My daughter was completely blown away by such a lovely surprise. This could not have come at a more timely moment as it cheered her immensely. She has had a difficult term, meeting many commitments and trying to overcome a recurrent viral infection that has left her feeling very low in spirit at times. Naturally she misses home and the end of term is only two weeks away. Please thank all your pupils for their kindness. Sometimes a little gesture can mean so much to someone as they may be feeling down. Their kindness has also travelled to a very chilly and cold Peak District and I feel so much happier today knowing my daughter has smiled today.